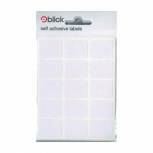 Blick White Labels in Dispensers 25mm x 50mm (Pack of 400) RS008958 Pack of 1 Blick Labels in Dispenser Packs. Easy to use dispenser packs allow for easy storage of large quantities of labels. Label Size: 25mmx50mm (400 labels per pack). Label Colour - White. Blick Black Coloured Labels in Bags Round 8mm (Pack of 9800) RS001751 Pack of 20 Ideal for product identification and many other office uses. 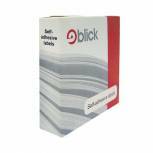 Blick label 8mm Black 490 labels per pack. Pack 20. 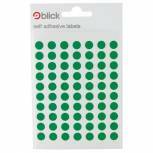 Blick Green Labels in Dispensers Round 19mm (Pack of 1280) RS011651 Pack of 1 Blick Labels in Dispenser Packs. Easy to use dispenser packs allow for easy storage of large quantities of labels. Label Size: 19mm diameter (1280 labels per pack). Label Colour - Green. (White illustrated). 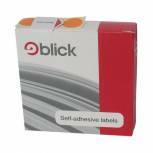 Blick Red Labels in Dispensers Round 19mm (Pack of 1280) RS012054 Pack of 1 Blick Labels in Dispenser Packs. Easy to use dispenser packs allow for easy storage of large quantities of labels. Label Size: 19mm diameter (1280 labels per pack). Label Colour - Red. (White illustrated). 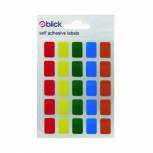 Blick Yellow Labels in Office 25mm x 50mm (Pack of 320) RS020158 Pack of 1 Blick self adhesive labels in handy window packs. Dimension 25x50mm. Labels per pack 320. Colour - Yellow. 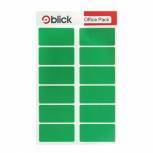 Blick Green Labels in Office Packs 25mm x 50mm (Pack of 320) RS019558 Pack of 1 Blick self adhesive labels in handy window packs. Dimension 25 x 50mm. Labels per pack 320. Colour: Green. 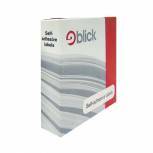 Blick Red Labels in Office 25mm x 50mm (Pack of 320) RS019954 Pack of 1 Blick self adhesive labels in handy window packs. Dimension 25x50mm. Labels per pack 320. Colour - Red. 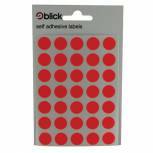 Blick Fluorescent Red Coloured Labels in Bags Round 13mm (Pack of 2800) RS004554 Pack of 20 For labels which really stand out use Blick fluorescent labels in a bag. 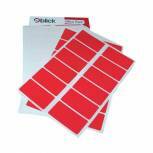 13mm Red 140 labels per pack, 20 packs per box. 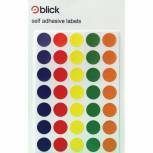 Blick Assorted Coloured Labels in Bags Round 13mm (Pack of 20) RS004950 Pack of 20 For labels which really stand out use Blick fluorescent labels in a bag. 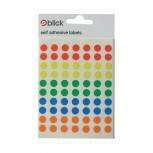 13mm Assorted 140 labels per pack, 20 packs per box. 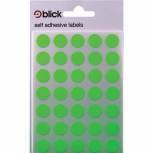 Blick Green Fluorescent Labels in Bags Round 13mm (Pack of 2800) RS004158 Pack of 20 For labels which really stand out use Blick fluorescent labels in a bag. 13mm Green 140 labels per pack, 20 packs per box. 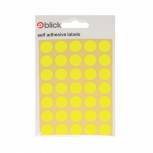 Blick Yellow Fluorescent Label Bag Round 13mm (Pack of 2800) RS004752 Pack of 20 For labels which really stand out use Blick fluorescent labels in a bag. 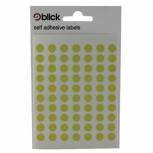 13mm Yellow 140 labels per pack, 20 packs per box. Blick White Labels in Dispensers Round 19mm (Pack of 1400) RS005551 Pack of 1 Blick Labels in Dispenser Packs. Easy to use dispenser packs allow for easy storage of large quantities of labels. Label Size: 19mm diameter (1400 labels per pack). Label Colour - White. 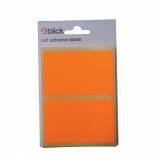 Blick Orange Fluorescent Labels in Bags 50x80mm (Pack of 160) RS010852 Pack of 20 Ideal for product identification and many other office uses. 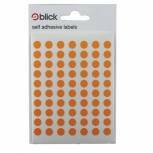 Blick label 50x80mm Orange 8 labels per pack. Pack 20.